De Wingerd is a pioneer, in Belgium and in Flanders on the subject of small-scaled housing for people with dementia. An innovative concept, inspired by initiatives in Scandinavia, improved in collaboration with LUCAS (Leuven University) and the Flemish Expertise Centers on Dementia and Network of small-scaled housing projects & normalized living for elderly. 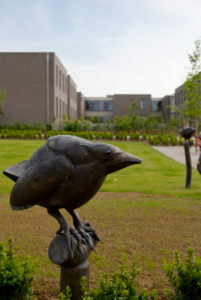 Concept and architecture in De Wingerd are entirely based on and developed in perspective of our mission and a unique vision about professional care and wellbeing for people with dementia; resulting in five core principles. We offer an alternative home to vulnerable yet valuable people, 8 residents per unit, thus creating a safe living environment with professional support: client-oriented and on demand, with respect for everyone’s personal needs, beliefs and identity. Together with the resident, family and friends, we continue their life story, writing a new chapter each day! each from their own experiences, with their own stories. Embodying the reality of warm care and solidarity. Moon Jae-in, president of the Republic of Korea and Mrs. Kim Jung-sook, tour Europe as a part of a presidential visit. 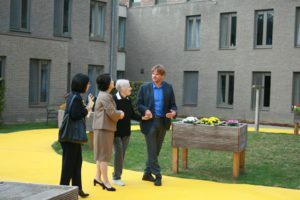 While her husband attends the ASEM (Asia-Europe Meeting) summit in Brussels to explain the bilateral peace talks between the two Koreas, Madam First Lady will visit the elderly care facility De Wingerd in Leuven. Mrs. Kim Jung-sook, First Lady of the Republic of Korea, visits the small-scale homes where people with dementia are supported in their daily life. 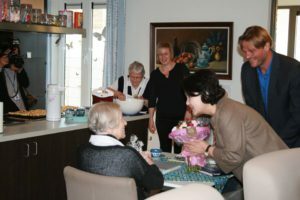 De Wingerd is a pioneer in Small-scale Normalized Living for people with dementia. Jan Vanwezer, director, explains the unique care vision and the operating principles of the person-oriented approach. 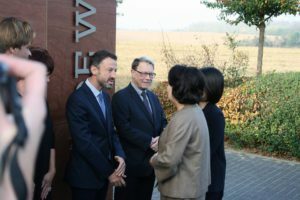 Woonzorgnet-Dijleland is particularly honoured with this visit and the international attention and we hope that madam First Lady can take home with her a lot of positive experiences and inspiration to South Korea!